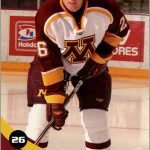 There are 22 player cards and one card of assistant coach Kevin McCarthy. 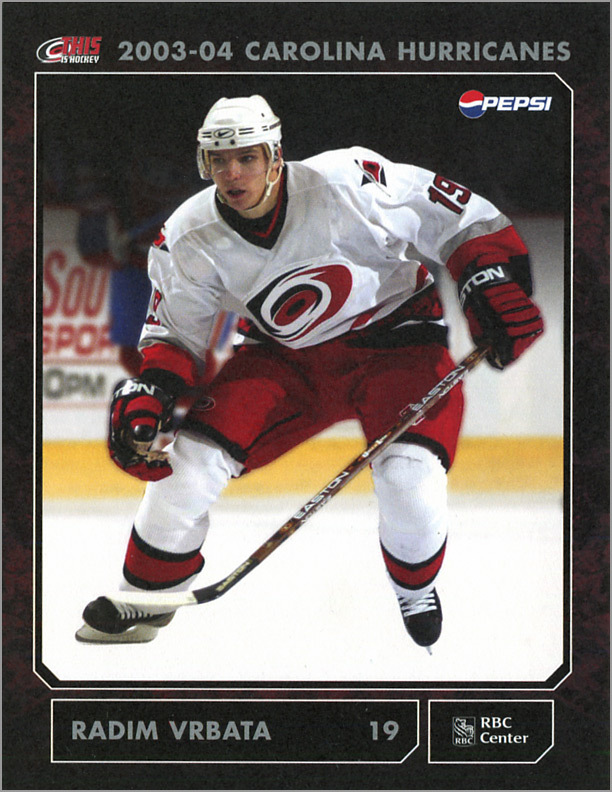 All the big names are here, like team captain and Hall of Fame center Ron Francis, eventual team captain Rod Brind’Amour, longtime Whalers/Hurricanes defenseman Glen Wesley and rookie/future franchise player Eric Staal. 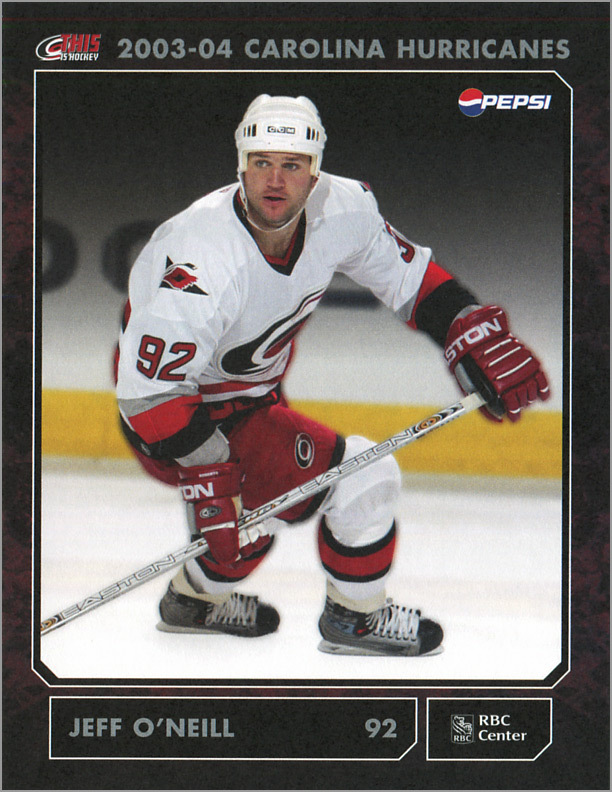 Pretty much every skater who appeared in 33 or more games is in this set, as well as first-string goaltender Kevin Weekes and backup Jamie Storr. These cards have a clean, simple design. The large player photo on the front is neatly bordered by text above and below. 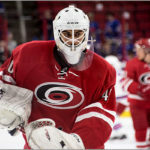 The background of the photo fades out at the top, making the player stand out. The top of the card has the Hurricanes logo, the team marketing slogan (“This is hockey”), the year and the team name. 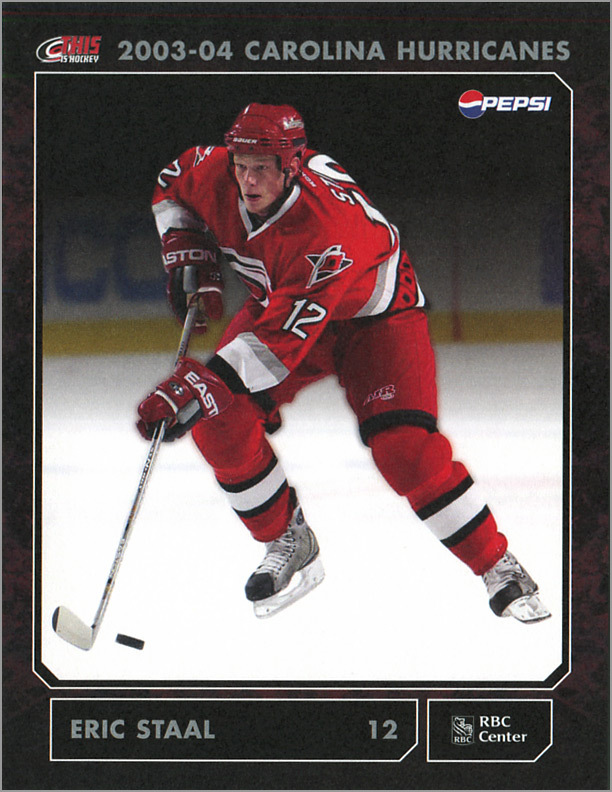 The player’s name and number are at the bottom, along with a logo for the RBC Center. Since Pepsi sponsored the set, a small Pepsi logo is at the top of each card. The only thing missing, though, is the player’s position. 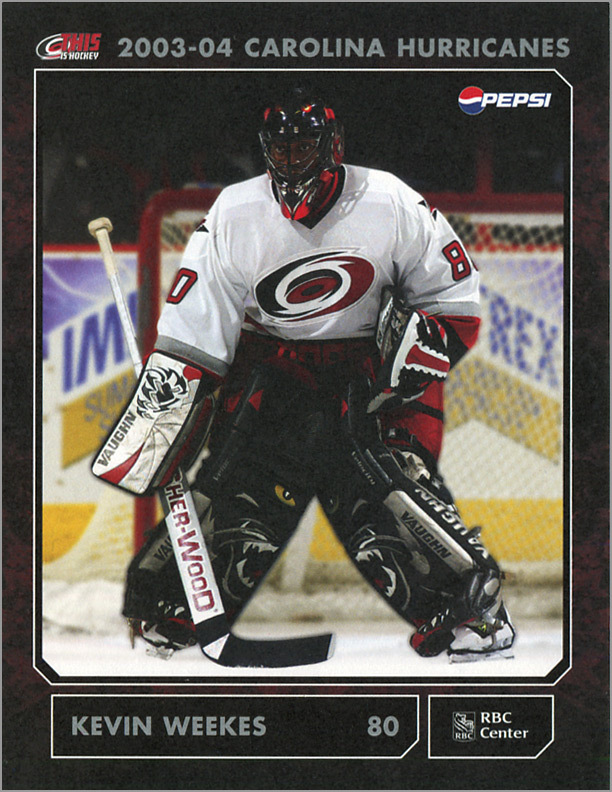 My guess is that this guy was a goalie. The cards are printed on card stock that is similar to the thickness of business cards. The cards also have a matte coating on the front. The backs are blank — so no stats or other information. Boo! Seems to be a missed opportunity, since these cards are large and could fit a lot of information on them. Then again, the Pepsi Corporation probably couldn’t afford the added expense of printing these cards on both sides. 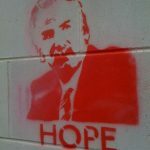 Where are the Other Coaches? The Carolina Hurricanes made a coaching change during the season. On December 15, 2003, head coach Paul Maurice and assistant coach Randy Ladoceur were fired and replaced by Peter Laviolette and Jeff Daniels, respectively. 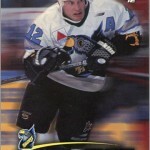 Kevin McCarthy, who was the other assistant coach and had been with the Hartford/Carolina franchise since 1992-93, was retained as an assistant. 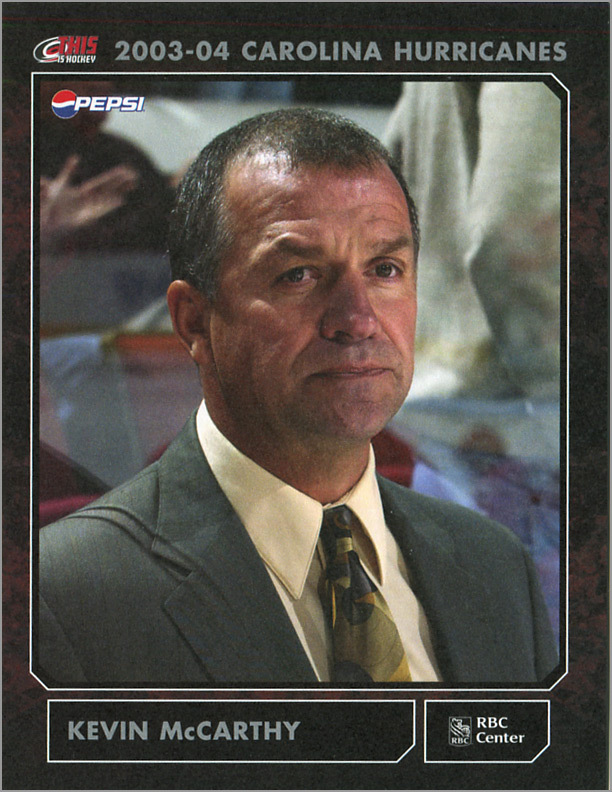 It seems odd that a team set would come out with a card of one of the assistant coaches, but not the head coach or the other assistant coach. My guess is that there were supposed to be cards of Maurice and Ladoceur, but they were fired right before this set was given away, so their cards were pulled at the last minute. 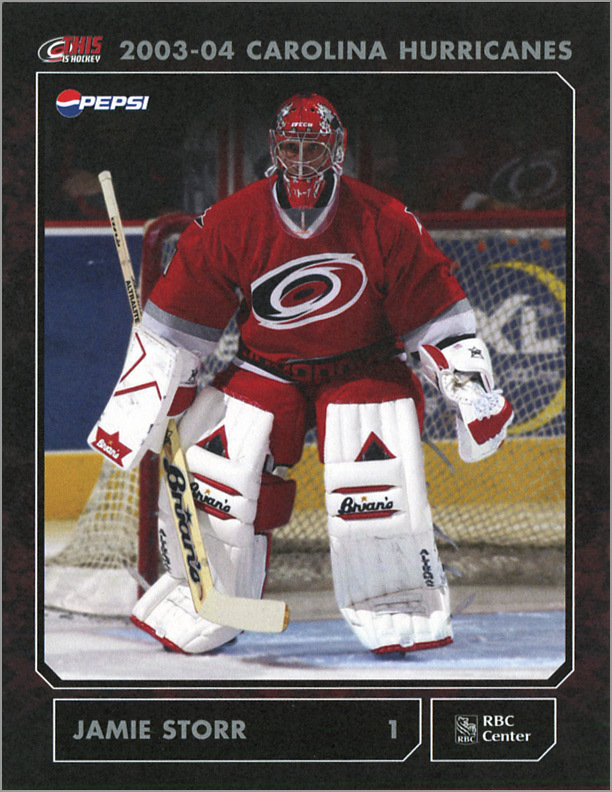 The 2003-04 Carolina Hurricanes team set is comprehensive and not inundated with sponsor logos. The matte coat on the front makes these ideal for getting autographed. The downside is that there are no statistics, or anything for that matter, on the back. 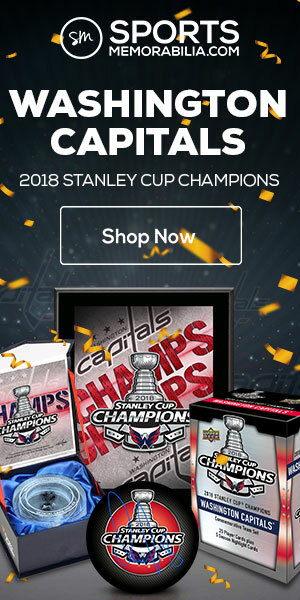 If you are a “Caniac,” then you’d probably give this set a “4” or a “5” and would want it in your collection. For collectors who aren’t necessarily Hurricanes fans, this set does offer some offbeat cards of several great players. 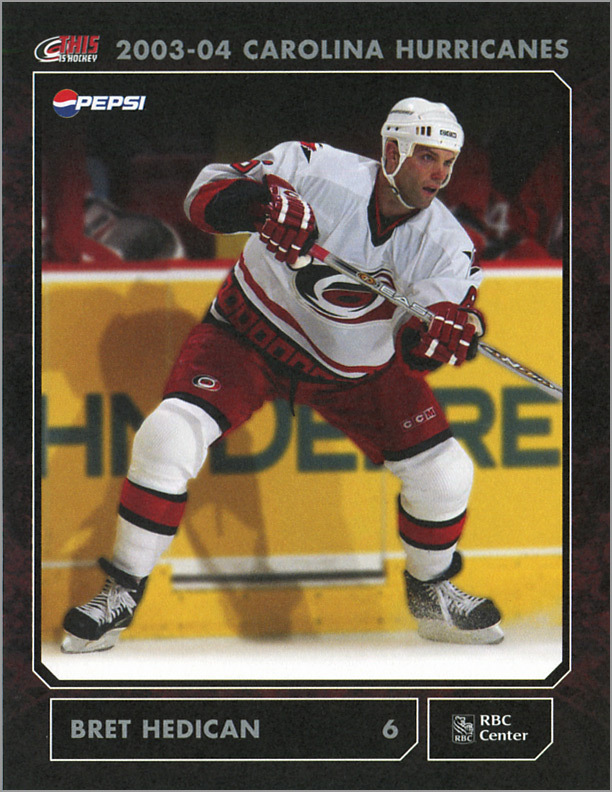 Six noteworthy Hurricanes in this set. 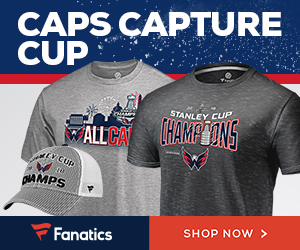 Niclas Wallin – The Swedish-born defenseman has four career goals in the postseason — all four were game-winners, and three were scored in overtime. 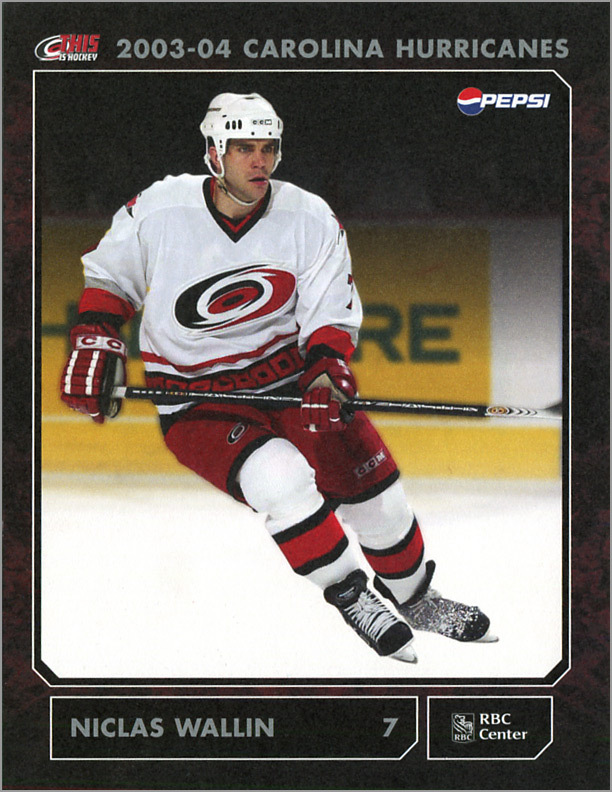 Ron Francis – The Hall of Fame center played 23 seasons in the NHL and is currently second all-time in career assists with 1,249. 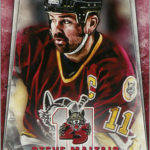 He won the Stanley Cup twice (with Pittsburgh) and won the Selke Trophy once and the Lady Byng Trophy three times. 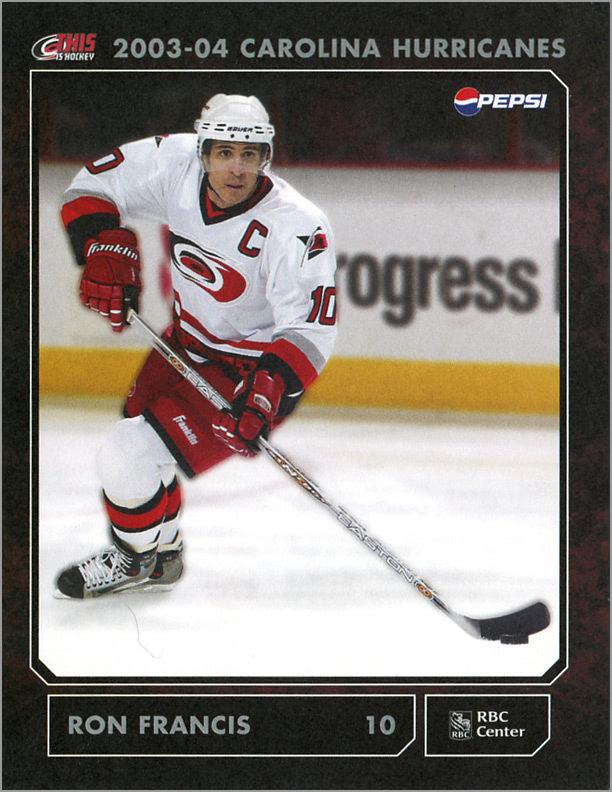 His number 10 was retired by the ‘Canes in 2006. 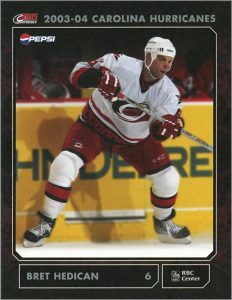 Glen Wesley – Wesley played 10 seasons with the Hurricanes. 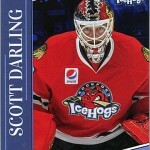 His uniform number 2 was retired by the team in 2009. 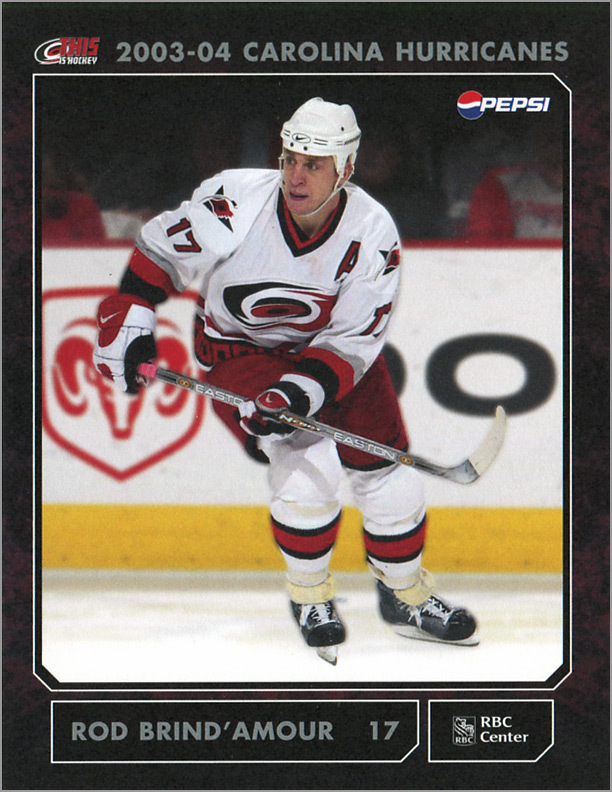 Rod Brind’Amour – Brind’Amour is the third player to have his number retired by the Hurricanes. He was their team captain from 2005 to 2010. Cool little set, Sal. 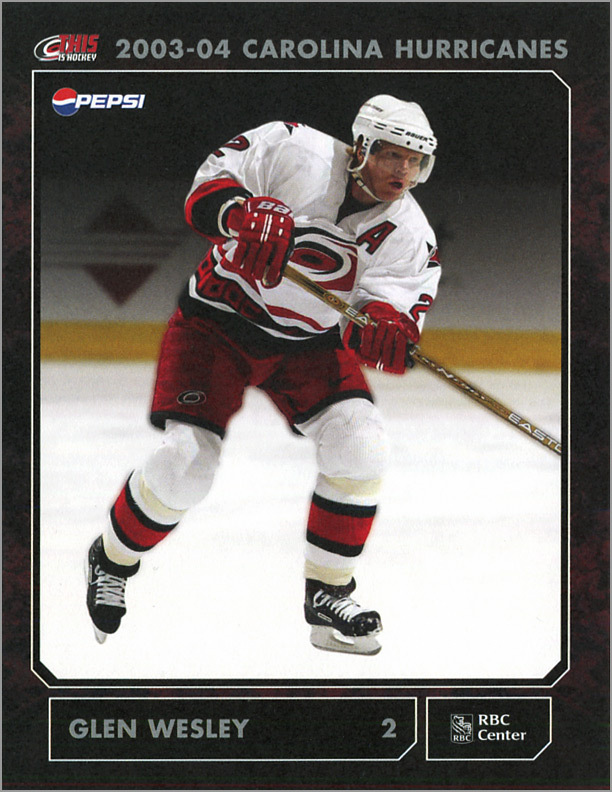 I can’t believe I never knew (or had forgotten if I did) that Glen Wesley’s number is retired by the ‘Canes!